An intense situation has developed downtown Morgantown near the West Virginia University campus where “riot conditions” have broken out. There is a large group of people and police. Police attempted to disperse the party but had beer bottles thrown at them. The “riot conditions” forced the police to back down the hill. Police are attempting to disperse a large party on Spruce Street but had beer bottles thrown at them, according to the scanner. 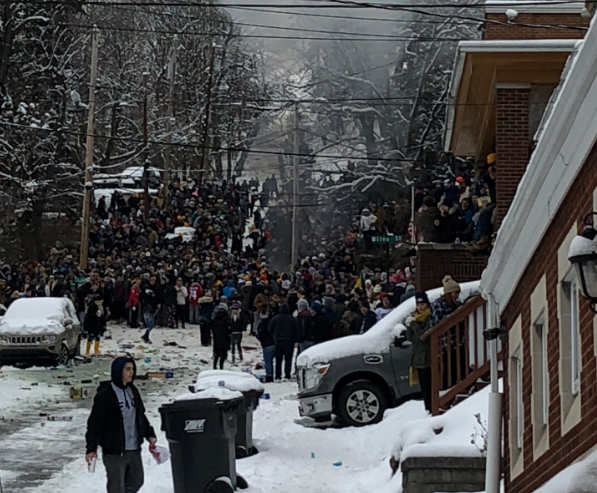 They are now backing down the hill due to "riot conditions"
West Virginia University was closed today due to a mix of weather conditions and frigid temperatures. A spokesman from West Virginia University said the school is aware of the situation and is preparing a statement. The MPD is currently responding to an incident on North Spruce Street involving a large crowd. The MPD is working to disperse the crowd. Chief Preston is not currently available for comment. We will provide more information as it becomes available. A viral video of the situation has exploded on Facebook and Twitter. It shows the officers who appear to be aiming paintball guns at the crowd. There is offensive language in the video. We will have more details on this story as they become available. How Can You Be a WVU Fan AND Pittsburgh Professional Sports Fan?